The NRG foot spa takes advantage of the body’s electrical nature to generate enhanced long-lasting energy and vitality. Whereas electricity is measured in terms of electron flow, the energy found in biological systems, bioelectricity is measured in terms of ion flow. Ions are charged atoms moving through cell membranes or through the body via the fluid systems (plasma, interstitial, lymphatic, and cerebral-spinal fluids, etc). You may be familiar with diagnostic tools such as the EKG and the EEG. Both provide measurements of the body’s bio-electric vibrations. Our energy level, or the “way we feel,” reflects our body’s bio-electrical activity. When we feel unnaturally “tired,” our cells are not functioning at optimal levels. Exposure to toxic substances, ingestion of foods lacking sufficient nutrients, living high stress lifestyles and getting little exercise greatly diminishes our bodies’ naturally vibrant energy levels. 2. Elimination of toxic substances from the body. Works is based on a very simple design. It consists of a module made of copper and stainless steel rings, and keys connected to a transformer with a built-in timer. The transformer converts the electrical output from the house into 24 Volt DC. The module is placed in a container filled with comfortably hot water (typically tap water, unless it has too high a solute concentration, in which case feel free to contact me for assistance). Salt may be added if necessary. Place feet in the water, set the timer to 40 minutes, and enjoy. The water also now has a bioelectric feature, just like our bodies do naturally. When we put our feet into this water, it is believed that our body’s bioelectric system matches that of the water, and a continuous circuit flows between the body and the charged water. Because it is believed that most toxins are positively charged when they reside in the body, they are attracted to the negative field of the water, and, thus drawn out of the body through the pores of the feet. Thirty to 40 minutes is the optimal time for a treatment, which ensures that the body’s circulating blood stream is sufficiently stimulated. Do you own a Salon or Spa? Do you love the Ion Detox Foot Bath so much that you would like to own your own? If so, you are in the right place. The Herb Garden is a supplier of one of the most reputable Ion Foot spas in the industry. We sell NRG Works foot spas to businesses and individuals that would like to invest in a product that pays for itself. Read more about Ion Detox Foot Bath Cleanse HERE. 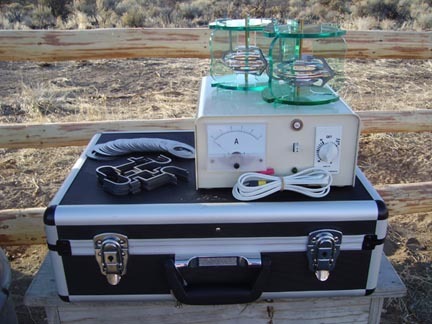 If you are interested in purchasing an NRG Works foot bath, call our office or drop by. CLICK HERE. The Herb Garden is an awesome place for info and products. Ms. Nicole is very helpful and knowledgeable. The ION foot bath really works and it was not in my head my pain actually went away. I thank her for the suggestion everyday I wake up without pain. She really takes time to listen and help. Some comments were edited for grammar and punctuation. Schedule your ION Foot Detox Cleanse today! Detox Foot Bath is an all natural way to dramatically remove toxins from the inside of your body through your foot in a relaxing bath by energizing the water. Detoxification begins the moment you place your foot into the foot bath. Detoxification benefits your health and can help the aging process.